Because we found a cheap flight from Rome to Nice, we pushed Rome back to the end of our time in Italy. Finally today we headed for the Eternal City. The Circumvesuviana train that we took from Sorrento to Naples runs on narrow-gauge rails similar to subway cars. As the name suggests, the Circumvesuviana system tracks around the base of Mount Vesuvius, as well as over to Naples and down the coast to Sorrento. 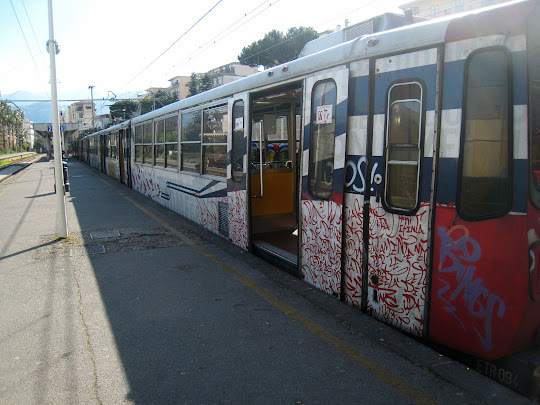 With tickets at bargain prices (€4 from Sorrento to Naples), the trains are very popular with both tourists and locals. Graffitists are also fans of these small train cars. The trains stop in every tiny village and run through lengthy tunnels lining the route. On board we were treated to a performance by a group of musicians-- a bass player, accordionist, drummer and singer/tambourine player. After a couple of songs, the singer went around the train car collecting tips and the performance was over. At the next station, they disembarked to find another venue moving back south. Once the concert ended, we enjoyed a conversation with a woman sitting across from us. In her early 40s, Lena told us she is a native of Luxembourg-- one of only 330,000 Luxembourgers worldwide, she said. She shared some very interesting information about this small but influential nation, where 40% of the population are immigrants. Most Luxembourgers speak four or five languages. Lena speaks Luxembourgish, French and German (which she began learning at age 7), English and Spanish (began learning at age 11). As we were able to observe, she also speaks enough Italian to get around. She emphasized how much easier it is to learn a new language after you have already mastered two or three. This proficiency with several languages makes it quite easy for Luxembourgers to travel and live and function easily in most any part of the world. 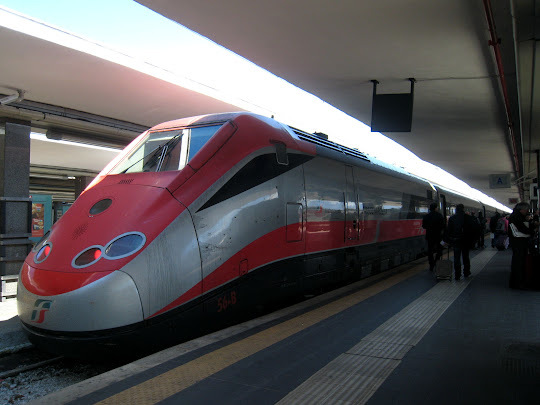 From Naples to Rome, our transportation was quite a bit faster and more comfortable, as we rode one of Trenitalia's Eurostar high speed trains. 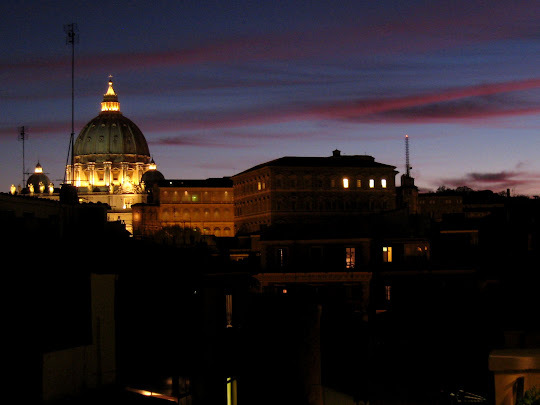 Once we arrived at Rome's Termini station, we located a taxi and were pleasantly surprised at the very reasonable €15 ($21) fare to our apartment. 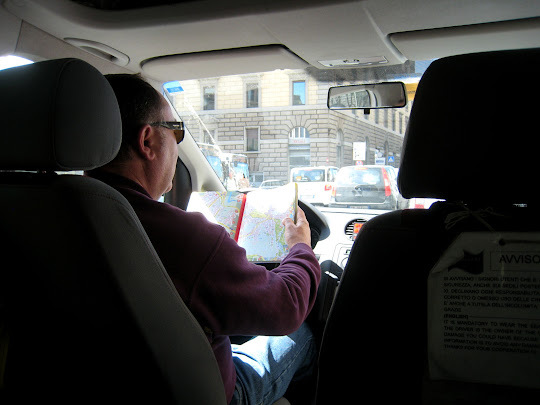 We weren't sure whether we should be concerned when the driver pulled out his map-- while he was driving. But then we remembered that old saying: "When in Rome... don't worry about whether your driver is actually looking at the road or not." And, indeed, he got us to our destination without a hitch. A visit to the neighborhood Despar supermarket scored some food and drink for dinner, and we returned to settle into our home for the next few days, drink a glass of wine and enjoy our view of St. Peter's in nearby Vatican City.